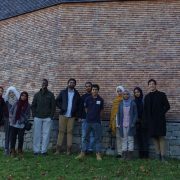 HALBAN The Department of Urban Planning and Architectural Design (UPAD) of GUtech has recently conducted a two week excursion to Austria and Germany. The excursion was partially sponsored by the German Academic Exchange Service (DAAD). “The main goal of the excursion was to inspire the students about previous building traditions, created by our ancestors and to create awareness about how those traditions are kept alive through innovation abroad and here in Oman. Our main question was how very isolated regions like Vorarlberg in Austria, with limited means developed a contemporary, highly admired architecture. Building traditions are not fixed, they are constantly changing. It is a spirit and innovated continuously,” said Wayne Switzer, Lecturer at the UPAD department, who was organizing and heading the excursion. These regions have steadily innovated the materials they had, for example wood. “Every year the builders went to Italy as hired carpenters, and then returned with new techniques which they adapted for their villages. 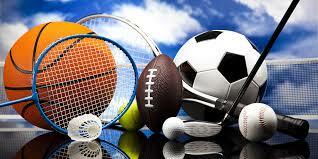 Similarly, nowadays many architecture students go abroad for training and internships,” said Wayne. During their excursion, students also saw parallels in materials which retain their cultural and practical value- such as the so-called shingle houses in Austria, e.g. in Vorarlberg old shingles made of wood are used as a primary material. “The students were fascinated that this traditional technique is still being applied in sophisticated buildings of today. They are not constrained by the past,” said Wayne. On a visit to the Kunsthaus Bregenz, prominent art museum in the Austrian city of Bregenz, students witnessed a luminous façade of glass panels – arranged in a similar “shingle” technique as traditional buildings in the surrounding region. The idea is to promote this innovative spirit here in Oman and to create new ideas for integrating the traditional building materials and techniques into today’s architecture. During the second week of the excursion the group attended an architecture and urban planning workshop at the Department of Architecture at RWTH Aachen University. In collaboration with RWTH students, GUtech students analysed areas of the city of Aachen and made proposals for how these might be sensibly developed. HALBAN The organizers of the 3rd International Symposium on Flash Floods in Wadi Systems held at the German University of Technology in Oman (GUtech) mid-December have released a list of recommendations regarding the implementation of the expert’s recommendations for the mitigation of flooding and disastrous damages in arid countries. “The participant scientists concluded that until today, there is no way to avoid flooding, which may cause disastrous damages,” said Prof. Ekkehard Holzbecher, Symposium Chair. “Even though, counter measures can be improved to reduce the risk of flooding and to mitigate negative effects by proper flood management, and future researches will focus on that direction,” he added. “Improved floodwater harvesting technologies will enhance groundwater quantity and quality in arid countries,” Holzbecher emphasized. Some arid countries like Morocco have developed a flood mitigation strategy including a ground water recharge. However, the wadi environment is always affected. Thus, there is a need to mitigate negative impacts of these structures and to study how to optimize the flood storage works. It is paramount to collaborate with different research institutes to develop new indices to quantify the changes of sediment and water budget and simultaneously the changes of vegetation, aquatic life and water quality. Moreover, social impacts must be evaluated, e.g. concerning urbanization, the loss of agriculture and the decreasing importance of Aflaj systems (traditional irrigation systems) in Oman. “The fourth International Symposium on Flash Floods in Wadi Systems will take place, at the University Hassan II in Casablanca (Morocco) between 20 – 22 November this year,” said Dr Ahmed Hadidi from GUtech and member of ISFF organizing committee. “The 4th ISFF will focus on urban flood risk management – mitigation and adaptation measures in the MENA region,” he added. In conclusion, the team of international experts, mainly from Oman, Germany, Japan, Morocco and Egypt suggest to carry out a more proactive approach in disaster risk reduction and the management of flash floods. This can be done through implementing a trans-disciplinary research team and by establishing an early warning system in Oman. Furthermore, it has been suggested to introduce a joint research programme including the water administration (Ministry of Water Resources, Water Board etc.) and academics such as hydrologists, modeller, hydraulic engineers, urban planners, as well as social scientists. On Sunday 15th October, Dr. Ayham Al-Rahawi, an Assistant Professor of Process Engineering at GUtech, attended the IChemE Oman Members Group Event at Muscat University with several Level 4 Process Engineering students. Trish Kerin was the key note speaker at the event and she discussed the topic of Process Safety, which included some interactive case studies, to teach the audience about the topic. Furthermore, the event acted to engage the Process and Chemical Engineering communities in Oman with opportunities for Professional Development, support with achieving professional qualifications and networking. Between 18th September and 1st October 2017, 36 students along with 3 Trip Supervisors (Dr. Hind Barghash, Dr. Roghaieh Parvizsedghy and Dr. Thomas Lattimore) went to Germany for the Measurement Techniques Laboratory Course at RWTH Aachen. 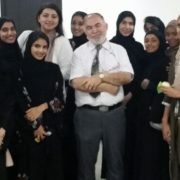 The Trip was primarily organized by Dr. Najah Al Mhanna, who was assisted by Dr. Thomas, along with Dr. Hind Barghash and Dr. Roghaieh Parvizsedghy. The DAAD sponsored the trip and the Department for Engineering also helped to fund the trip. 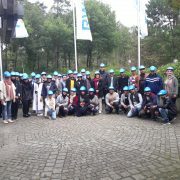 The students visited RWE Nuclear Power Station in Lingen, Germany, as part of the trip, as well as having the opportunity to visit some local tourist destinations, and of course, completing the Measurement Techniques Lab at RWTH Aachen University. Not everything went smoothly on the trip but overall, everybody had a very good time and it provided the students with the experience of International Industry and the experience of studying a University Level Course abroad. 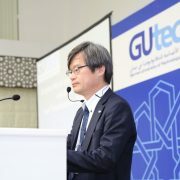 HALBAN Prof. Dr. Hiroshi Amano, the Nobel Prize Winner in Physics (2014), gave a public lecture entitled “Brighter World and Sustainable Life with Blue LED and Transformative Electronics” at the German University of Technology in Oman (GUtech) on Monday evening. He was accompanied by the former Japanese Ambassador to the Sultanate of Oman, H.E. Seigi Marimoto. Prof. Hiroshi Amano is currently on a visit to the Sultanate of Oman. Prof. Dr. Hiroshi Amano was awarded jointly for the Nobel Prize in Physics with Prof. Dr. Isamu Akasaki and Prof. Dr. Shuji Nakamura. The three scientists received the Nobel Prize for their invention of efficient blue light-emitting diodes which has enabled bright and energy-saving white light sources, LED lights. Prof. Hiroshi Amano started his research on LED lights already in 1981, when he joined a group of researchers as an under-graduate student. “At that time the energy consumption was high and he wanted to find a solution. We even developed our own research equipment,” recalled Prof. Amano. Lighting plays an important role in our everyday lives. The development of light-emitting diodes (LEDs) has made more efficient light sources possible. Creating white light that can be used for lighting requires a combination of red, green, and blue light. Blue LEDs proved to be much more difficult to create than red and green diodes. During the 1980s and 1990s Prof. Isamu Akasaki, Prof. Hiroshi Amano, and Prof. Shuji Nakamura successfully used the difficult-to-handle semiconductor gallium nitride to create efficient blue LEDs. According to Prof. Amano by using LED light, Japan reduced its annual electricity consumption by 7 %. Consequently, energy efficient LED lights contribute to the reduction of CO2 emissions and global warming. Last year Prof. Amano visited Mongolia. “I was happy to discover that LED lamps are used in the traditional Mongolian Ger tents,” he recalled. A few years ago, Prof. Amano initiated a network of scientists who works on the “Internet of Energy”, the so-called “Future Wireless Power Transmission Network”, an open innovation platform that develops sustainable, smart solutions regarding future energy challenges of our societies. He spoke about the drone super highway, air-taxis “In future we will be able to connect at any time and any place” he said. Finally he stressed, that students who are interested should contribute with their knowledge and ideas “If you wish to contribute to develop ideas, you should play a leading role” he said. On the side lines of the talk Prof. Hiroshi Amano spoke about the Nobel Prize Award ceremony and his big surprise when the award was announced in October 2014, while he was travelling between Japan and France to attend a conference there. “I could not understand what had happened,” he said.